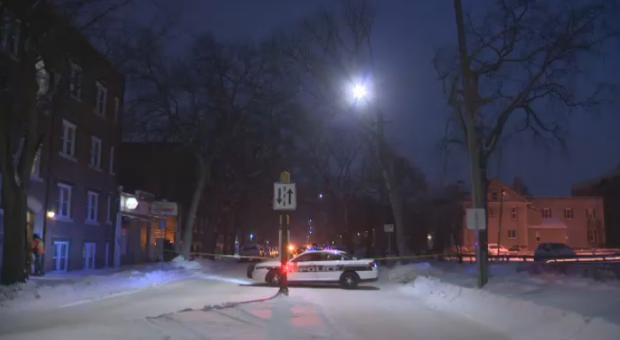 A large number of police officers were outside of a building in downtown Winnipeg Monday evening for what Winnipeg Police Service called an "ongoing serious incident". A 35-year-old man is facing a slew of charges after one woman reported being assaulted to the point of unconsciousness and another said she was held against her will. On Wednesday around 3:30 p.m. police received a call about an assault in the 100 block of Colony Street. The caller, who is a 26-year-old woman, said she had been assaulted to the point of unconsciousness and when she woke up, she fled with her kid. She also said the male suspect was in a suite in the 100 block of Colony Street, that he was with another woman, and he could have weapons. She was treated for minor injuries. Police said when officers attended the man wouldn’t let them in, and said there was a woman in the suite and that he had a gun. Police then secured the area and treated the incident as an armed and barricaded situation. Around 12:30 a.m. on Tuesday, members of the tactical support team went into the suite and found the suspect and a 28-year-old woman. Police allege the woman had been held against her will but was not hurt. The 28-year-old told police she was previously assaulted on Jan. 4. Police said that on Jan. 7 the suspect had been seen with two clips of ammunition for a rifle he possessed. On Jan. 8, a number of items were taken from a home in the 500 block of Selkirk Avenue. The next day, police found a laptop that had been stolen in the 400 block of Elgin Avenue. James Charles Grieves, 35, has been charged with a number of offences including assault, forcible confinement, assault causing bodily harm and theft under $5000. He is detained at the Winnipeg Remand Centre.